Everyone on Earth has seen the splendor of the flowering cherry trees of Japan, which give such delicate beauty to the landscape every Spring there. But the huge carpets of pink blossoms from peach orchards, which transform the Imathia region of Greece’s Central Macedonia, are equally as stunning, and are among the world’s best kept secrets. Every spring, the plain between Thessaloniki and West Macedonia, near the cities of Veria and Naoussa in the region of Imathia, turns into a spectacular quilt of hot pink and vivid green. The sight, seen especially well from the foothills of Mount Vermio, equals or surpasses any other springtime floral display anywhere in the world. “What we see before us each March is an endless pink carpet of flowering peach trees,’’ said Zisis Patsikas, president of the Veria Tourism Club, speaking with the state-run AMNA News Agency. The town of Veria has held an open photographic competition featuring the local peach trees in blossom for the past three years. Every year, more than three hundred individuals, including both amateur and professional photographers, participate in the competition. Patsikas noted that the 2018 winner was an Athenian who had traveled to the region especially for the competition. This year’s competition will take place in the city of Veria during March 16-17. Imathia peach tree blossom. The woman is wearing a “Martis” bracelet which celebrates the arrival of Spring. Inspired by Japan’s way of promoting tourism featuring its emblematic famous cherry blossoms, Imathia residents are beginning to promote the annual blooming of their treasured peach trees. The region is already known as a popular winter destination, as it is home to two of Greece’s best ski resorts, Seli and 3-5 Pigadia. On Sunday, March 17, a 17-kilometer ”Bicycle Ride Through the Flowering Peach Trees” will be held in the region, offering participants an opportunity to discover and admire the spectacular display in an entirely new way. 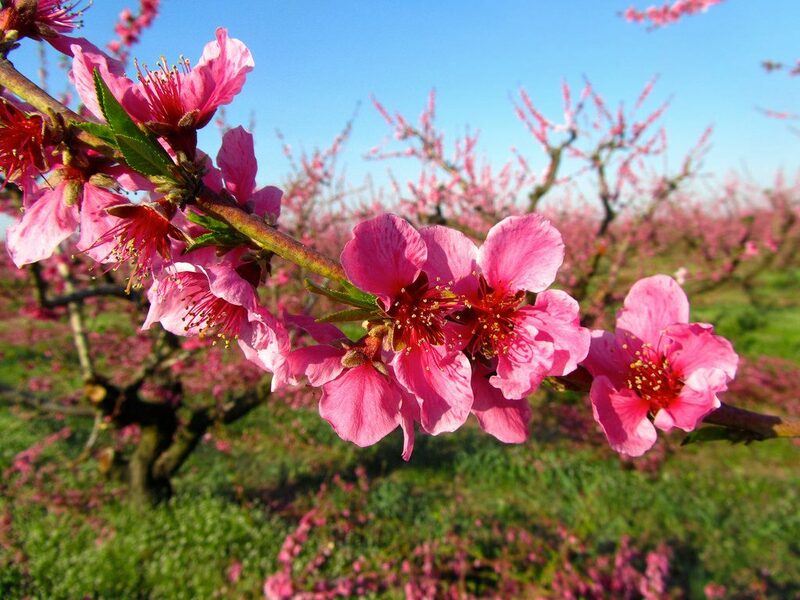 The peach blossoming time lasts for approximately fifteen days in northern Greece, and occurs between late February and mid-March. Imathia’s peaches are well known all across Europe. They are one of Greece’s most successful export products, and thousands of people work in that agricultural sector in the region.